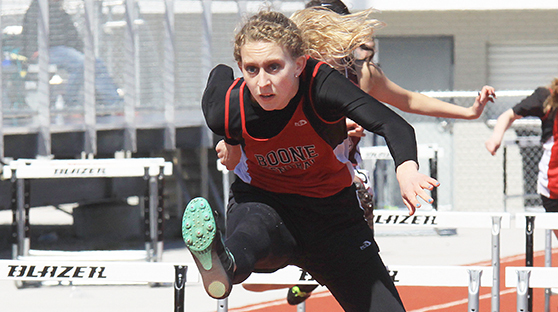 After opening the season hosting the Mansfield Invitational in Albion, Boone Central/Newman Grove’s track & field teams took a step up in competition Tuesday, April 5, at the Wayne Blue Devil Invite. The results were quite impressive. BC/NG placed third in strong girls’ and boys’ divisions and Lady Cardinals established two new school records, while also setting three stadium standards. “The teams had another very successful day,” Card Coach Kris Pestel acknowledged. “Sheldon Beierman set a Boone Central school record in the high jump, clearing 5’4, and Celine Dunlap set Newman Grove and Boone Central records by going 10’6 in the pole vault. Those were also meet records, along with Sheldon running 48.08 in the 300 meter hurdles. Beierman had a triple-gold day to lead the Lady Cards, winning the high jump, 300 meter intermediate hurdles and the 100 meter high hurdles (16.19). Dunlap, along with her win in the pole vault, placed second in the 100 meter dash (13.79), fourth in the 200 dash (29.62), and ran a leg on the second-place 4×100 meter relay (55.79). The BC/NG girls dominated the distance events, with Ashlynn Baker winning the 3200 meter run (12:18.38) and 1600 meter run (5:41.87) and Christina Stopak finishing runner-up in both the 3200 (12:41.15) and 1600 (5:59.59). Jenna Kramer, Tessa Hedlund and Kelsey Thompson joined Dunlap on the runner-up 4×100 squad and Karley Zoucha posted a third-place throw of 33’7 in the shot put. The BC/NG boys had one event champ, as Isaac Sullivan won the shot put (49’). Jessie Sullivan was runner-up in the discus (130’2), while Dalton Wagner took third in the discus (129’2) and fourth in the shot (45’7½). Damian Backus had another strong scoring day, placing second in the 100 meter dash (11.87), third in the long jump (21’5) and fourth in the 400 meter dash (53.14). Scott Ketteler took runner-up in the 110 meter high hurdles (16.21) and third in the triple jump (40’1). Jared Zwiener placed second in the pole vault with a 12’6 effort, and Backus, Kyle Kramer, Levi Krueger and Cody Nelson teamed to finish second in the 4×100 meter relay (45.93).